For as long as I've been making them, my halloumi kebabs have been making people swoon. At every barbeque or pot luck, they disappear and are replaced with oohs, ahhs, and requests for the recipe. The recipe is so simple and easy that I know it by heart, making it easy to share. 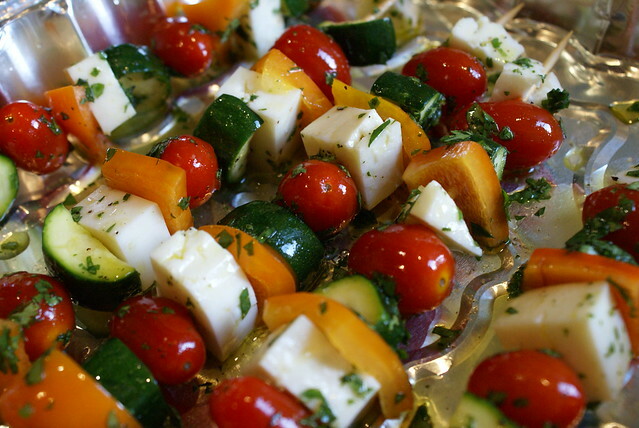 Although they're a hit at barbeques, I prefer to make them in the oven, rather than on an open grill, in case some halloumi fall off. Thou shalt not waste halloumi. 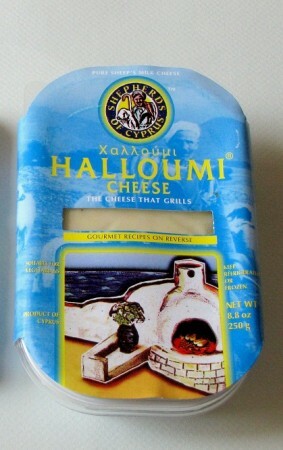 If you're not familiar with halloumi, it's a cheese from Cyprus. But not just any cheese! Halloumi is the "cheese that grills." Rather than melting and becoming a mess, this salty, rubbery cheese made of sheep & goat's milk softens and browns around the edges. It is usually packaged in its own brine, like this. Look for it in the specialty cheese section of your grocery store, and if they don't carry it, ask. That's what I did at HEB in Midland, and they've carried it ever since. 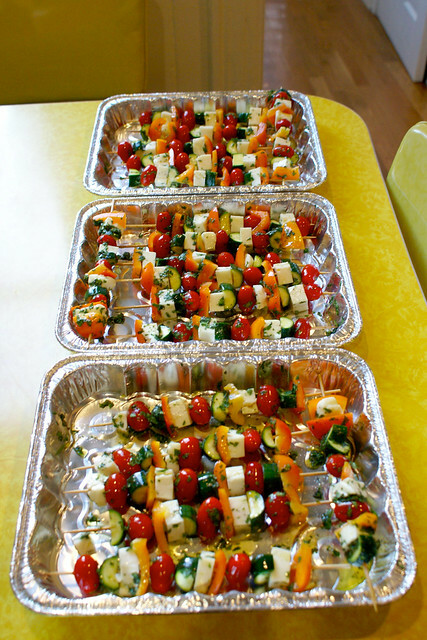 Skewer the halloumi and vegetables and place kebabs on baking dishes. Add the halloumi slowly to avoid breakage. In a small bowl, mix cilantro, salt, pepper and olive oil. Use a brush to apply the marinade, turning the kebabs to coat all sides. Make more marinade if you need it. Marinade for 2 hours, occasionally reapplying the marinade that has dripped into the pans. Preheat your oven to broil/grill and place the baking dish on the top shelf of the oven. Broil for a few minutes until cheese is golden brown, keeping an eye on them to make sure they don't burn. Expect some sizzling and smoking while they cook. Enjoy! As always, let me know if you've tried it. I've been doubling the recipe for a while, because there never seem to be enough of these at large parties. I think another good party idea would be to make them bite size on toothpicks, but I haven't tried it.